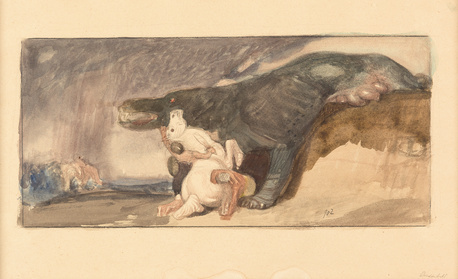 This watercolor is a finished study for Jettmar's oil painting of 1902, "Drachenbild II," Hofstätter Ö 37, in the National Gallery, Prague. (Inv. Nr. 0-4044). See: Otto M. Urban, Mysterious Distances: Symbolism and Art in the Bohemian Lands, 1880-1914 (Prague: Arbor vitae, 2014), pg. 115, ill. 159 ("Dragons and Monsters -- Men with White Horses," 1902). 1984 Hans H. Hofstätter, Rudolf Jettmar (Vienna: Tusch, 1984), AE 39; the catalogue raisonne.